The SE Uplift Land Use and Transportation Committee (LUTC) meets the third Monday of each month (except December) from 7 to 9 PM at the SE Uplift offices, 3534 SE Main St. Portland. The agenda is available one week in advance. To be included in the agenda distribution and latest news and announcements, sign up for the LUTC Updates on our main page. SE Uplift has an active Land Use and Transportation Committee comprised of representatives from each of SE Uplift’s 20 neighborhood associations, along with other community members, businesses, and interested individuals. All are welcome to engage in these monthly discussions! 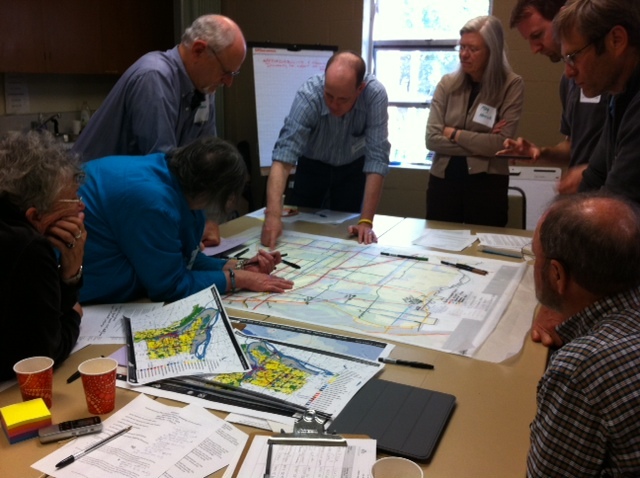 The Land Use and Transportation Committee serves as a forum for information sharing, discussion, and evaluation of land use and transportation plans and policies that effect neighborhoods in the SE Uplift area. The committee frequently invites representatives from the City of Portland, Metro, TriMet and other organizations to speak on a variety of current issues. The LUTC may also make formal or informal recommendations to the SE Uplift Board in favor or in opposition to significant land use or transportation issues that affect multiple neighborhoods. Committee members may also represent SE Uplift on Citizen Advisory Committees and other working groups to ensure the concerns of neighbors are addressed in the development of public policy. The LUTC is also an opportunity for neighborhood representatives to get to know their neighbors and collaborate around shared land use or transportation concerns or issues. Beginning May 2016, 15 neighborhood representatives participated online and in-person to collaboratively draft our LUTC Charter. The Charter outlines the purpose, principles, and authority of this Committee along with the role of participants, relationship to other groups, and more. Review the LUTC’s FINAL Charter. December No Meeting No Meeting Happy Holidays! May 21st Agenda Summary BPS Project Updates, SMILE Letter-Overpass, 82nd Ave Advocacy Request, DOZA documents. August ABC’s Training* None *An ABC’s of Land Use Training (1/2 sessions) will take place during this time. This is a great training opportunity for new land use/transportation representatives & other advocates to learn some basics about the City Bureaus, Land Use Systems, and opportunities for community input in those systems/processes. See the flyer here; RSVP here; and be sure you are familiar with the Neighborhood System by reviewing materials here and here. Questions, agenda requests, need archived meeting notes or agendas? Contact the Neighborhood Planning Program Manager: Leah Fisher, leahf@seuplift.org (503) 232-0010 ext. 313.